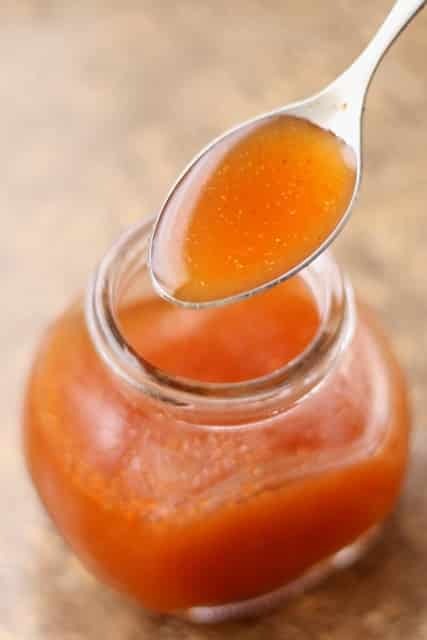 This Homemade Cough Remedy is a spicy, honey-cider syrup potent enough to calm a cough and sooth a sore throat. Over the past few years, this handy little remedy has become one of the most popular posts on this website. As I mixed up a batch for my son last night, I decided to re-share it with all of you, as a testament to just how much we use it! After making it all the way through the holidays without a cough, a sneeze or a fever, cold season hit us like a freight train on New Year’s Day. My boys were miserable and I started to feel it as well after a couple of days. I remembered saving this Homemade Cough Remedy recipe to try, so I shook up a tiny little test batch and tested a spoonful on myself. Consider yourself warned, this is seriously spicy and potent enough to actually clear your head. Personally, I think it tastes better than any store-bought syrup I’ve tried. 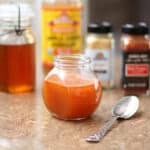 With only a handful of pantry ingredients and a few minutes effort, this Homemade Cough Remedy was sitting on my counter. I was amazed at how well it worked to completely clear our congestion. My oldest son was willing to try it as well and I couldn’t believe how quickly it worked on his cough. It cleared his throat and he slept solidly through the night. Over the counter cough medicines don’t even accomplish that for us!The powerful ingredients in this remedy are common everyday items: ginger, cayenne, cider vinegar and honey. Yet they work together to create a potent remedy for cold symptoms. It’s definitely worth trying before turning to the medicine cabinet once again this winter. Updated to add: I’ve been making this Homemade Cough Remedy for so long now, all three of my kids request it anytime they start coughing. The serving size (or dosage) will vary depending on the person. My 11 and 13-year-old sons take a tablespoon without a problem, my 7-year-old takes about a teaspoon. A full tablespoon works great for my husband and for me. Kitchen Tip: I use this jar to store the cough remedy. 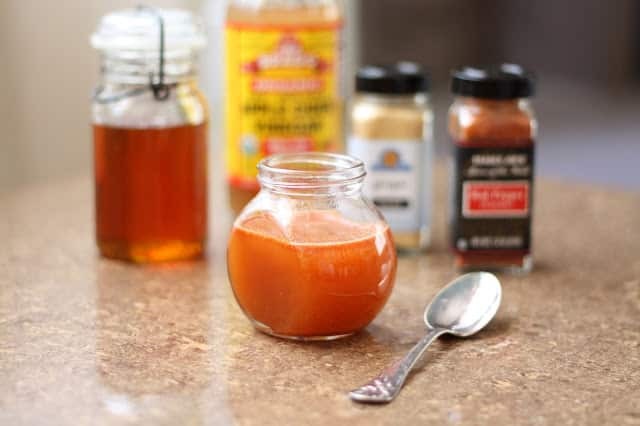 This remedy is a spicy honey-cider syrup potent enough to calm a cough and soothe a sore throat.Recipe gently adapted from and with thanks to Good Food Matters. Place all the ingredients in a small jar and shake to combine. Leave at room temperature for a few days or place in the refrigerator for longer storage. Shake well each time, before using. The spices will not dissolve into the liquid. It will not be a thick syrup, it should remain watery. Take as needed and have a happy and healthy new year! Haven't tried it myself, but I made it for my 16 yrs old son, and almost immediately his throat felt better, while his coughing diminished quickly, after his 2nd or 3rd treatment his cough was almost gone; took about 3 days for him to get rid of his cold. I'm so happy that it helped! I have been making this for about two years. I can’t believe how well it works. It is nasty tasting, but worth slugging it down to get the benefit of it. My husband, who hates spicy, will get it down with lots of grumbling and sometimes bad language. He thinks it helps him sleep also. Probably the honey. I have given the recipe to lots of friends with the warning that if they tell my husband what’s in it, the friendship is over. I make 8 times the recipe and keep it in the refrigerator. It lasts us about a year, works just as well at the bottom of the bottle. Thank you so much for this great recipe. I'm thrilled that it has helped your family, Gail! I made this recipe this morning as I have not been able to slee for two nights bc of congestion and cough along with a sore throat. I must say I’ve taken 2 teaspoons so far today and I’m coughing a lot less and praying for a good nights slee tonight. I’m not sure if this remedy had anything to do with it but it seems to be clearing a lot of moucus up when I blow my nose which is a plus!! Thanks! I'm thrilled that the cough remedy was helpful, Cheryl!